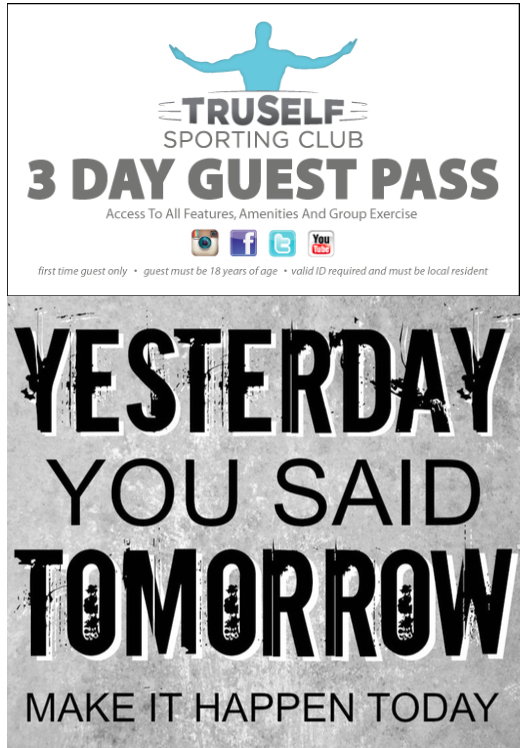 *Exclusive 3-Day Guest pass is valid beginning on your first day of usage at our gym. User must not have been a guest or member of TruSelf Sporting Club within the last 6 months. Photo ID required. No other discounts can be used with this offer. Must be at least 18 years old or 12 with parent. Personal Training available to guest pass guests for an additional fee. Exclusive 3-Day Guest pass also includes access to, Personal/Group Training, Premium Group Exercise classes, and Massage Therapy Services. Incentives offered for guest pass trade in’s on first day only. Not for re-sale or transfer. No cash value.